SEAN: Thanks to Yen spacing out its releases more evenly this month, we get TWO crushing weeks in a row instead of just one. So what’s in the first crushing week? Bookwalker has a 7th volume of shogi and young girls light novel The Ryuo’s Work Is Never Done!. J-Novel Club gives us the 13th In Another World with My Smartphone, a 4th Sorcerous Stabber Orphen, and the 10th Demon King Daimaou. Kodansha is making up for being virtually invisible the last two weeks. First, we have three debuts, two in print/digital and one digital only. 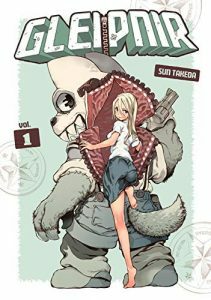 We’ll start with Gleipnir, a seinen manga from Young Magazine the 3rd, which is about a young man who discovers that he can turn into… a heroic dog mascot thing? Not sure what’s going on here, but one thing I can guarantee, which is the girl who’s the other lead will be beloved by Japan and hated in North America. Love in Focus (Renzu-Sou no Sankaku) is a shoujo-ish manga from Aria (the magazine of shoujo-ish titles). A girl chooses a high school for its photography program, but also gets involved in teen romance. It’s only 3 volumes. MICHELLE: Love in Focus is by Yoko Nogiri, whose That Wolf-boy Is Mine! I really liked. I’m looking forward to this one. ASH: I plan on checking it out, too; I liked what I read of That Wolf-boy Is Mine!. MELINDA: I’m up for this! SEAN: Lastly, the digital debut is Ran the Peerless Beauty (Takane no Ran-san), a shoujo title from Betsufure about a girl who’s so beautiful and stylish that no one approaches her at all… except one guy, of course. This actually looks pretty cute. ANNA: I am for sure curious about it! SEAN: Print Kodansha also has Again!! 7, Aho-Girl 11, Hitorijime My Hero 2, the 3rd Sailor Moon Eternal Edition, and a 16th UQ Holder. ASH: I’m a bit behind, but I’m looking forward to more Again!!. SEAN: Digitally there is also All Out!! 8, Back Street Girls 8, Kira-kun Today 5, A Kiss, for Real 8, and Tokyo Revengers 5. Seven Seas also has a debut next week, and a single-volume debut to boot. Total Eclipse of the Eternal Heart (Gesshoku Kitan) is from Akaneshinsha’s Opera magazine, and thus a must buy. It’s BL but also horror, and is from the author of Go For It, Nakamura!. MICHELLE: I am so looking forward to more from this author! ASH: Go For It, Nakamura! was one of my favorite releases from last year. 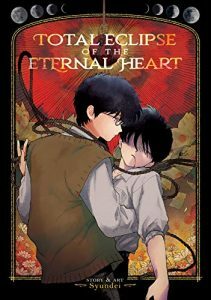 Total Eclipse of the Eternal Heart is supposed to be completely different in tone, but I love a good horror manga, too, so I’m excited. SEAN: Seven Seas also has another light novel for The Ancient Magus’ Bride: The Silver Yarn; the 9th volume of Citrus; a print edition for the 5th Make My Abilities Average light novel; The 3rd and final volume of the True Tenchi Muyo! light novels; and a 2nd Versailles of the Dead. ASH: I’ll be picking up The Silver Yarn. The first volume of Versailles of the Dead intrigued me enough that I’ll be picking that up, too. SEAN: Vertical gives us the 4th and final volume of The Delinquent Housewife!. MICHELLE: I’ve been collecting these volumes as they’ve been coming out. Maybe now that it’s complete I’ll actually read them! SEAN: Viz has a surprise for you! Not only do we get Gangsta 8, the first new volume in two and a half years, but we also get 1-8 digitally now as well! They also have 20th Century Boys: The Perfect Edition 3 and Children of the Whales 9. ASH: I’m very happy to have a new volume of Gangsta being released! ANNA: Also super excited about =Gangsta! SEAN: And so we have Yen Press. We’ll start with Yen On, who moved a few titles (including the month’s debut) to the week after, but that still leaves a lot. The Asterisk War 9, Defeating the Demon Lord’s a Cinch 3, Do You Love Your Mom? 2, The Irregular at Magic High School 11, Is It Wrong to Try to Pick Up Girls in a Dungeon? 13, Kingdom Hearts: Birth by Sleep (which sounds like a horror title), Magical Girl Raising Project 6, So I’m a Spider, So What? 5, and WorldEnd 3. That’s a lot of light novel. There’s a bit of manga as well, of course. The debut is a side story, as we get the first volume of Angels of Death Episode 0. A prequel, I assume. And we see Bungo Stray Dogs 10, Chio’s School Road 3, Kakegurui – Compulsive Gambler 9, the 10th manga version of My Youth Romantic Comedy Is Wrong As I Expected, a 5th Smokin’ Parade, the 5th volume of the manga version of So I’m a Spider, So What?, and the 5th volume of Sword Art Online spinoff Girls’ Ops. That is a lot, I just compressed it well. What are you getting? …But i still want to read it (maybe in Japanese).